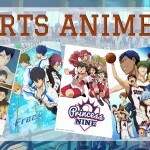 The response to the Sports Anime post was so enthusiastic that I am back again to highlight some gaming anime titles! My apologies to fans of the “stuck in a video game world” trope, you will have to wait your turn. These main characters are all into tabletop games! (If you must have a video game anime recommendation, I wrote about Summer Wars last year in my Anime Titles for Book Lovers to watch this Summer post. 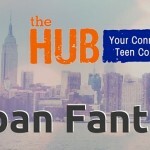 What we have this month is a series about a haunted strategy board game, a dramatic show about a group of teens who trying to form a competitive memory card team, a slice of life comedy starring a mischievous student who distracts his classmate, and a series focused on trading card game battles. Gaming is another broad sub-genre. While I attempted to select a range of games and themes, if you feel like I missed a show that this list cannot survive without, feel free to bring it up in the comments! Hundreds of years ago Sai Fujiwara flung himself into a river when he was dismissed from his position as the emperor’s Go instructor. Since his death, he has haunted a Go board hoping to someday achieve his dream of playing one “Divine Move.” Hikaru Shindo, the sixth grade boy he is currently haunting, doesn’t seem to mind his spectral hitchhiker. Will the two be able to work together to make Sai Fujiwara’s dream come true? 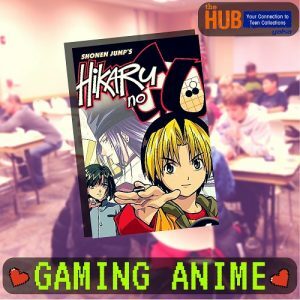 Hikaru no Go is the least spooky ghost story in the world, mostly because the show is so focused on the gameplay of Go and the interpersonal relationships of the players. While the 23 volume manga series is still available in the United States, the DVDs of the show are out of print. But do not despair! both the subtitled and dubbed versions of all 75 episodes the show are available to stream (with commercials) on Viz’s website and Hulu. 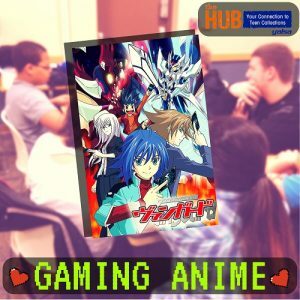 If you run an anime club or a convention you can contact Viz directly on their website using this form to ask for permission to screen the show to your group. A two player strategy board game that you can pick up and play for little to no cost. The goal of Go is to capture the opposing player’s pieces by surrounding them. Learn more at the American Go Association’s website. A skillful blend of humor and drama, there are two season so far of this series. You get to know each character through multiple flashback sequences, so the main plot has a slow and steady build. This slow and steady pacing is balanced out by the aggressive animation of the karuta gameplay sequences. 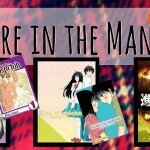 The English translation of the manga is out of print, but both seasons of the show are streaming on crunchyroll and if you are running a convention, anime club or library group you can request a commercial free account through crunchyroll’s outreach page. 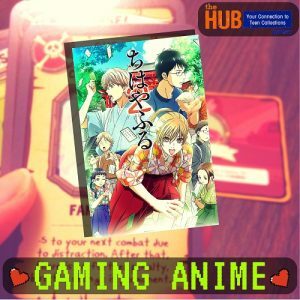 The version of karuta played in Chihayafuru deals with poetry. The last lines of 100 different poems are printed on cards. The goal is to match the beginning lines of these poems, which are read aloud, to the end lines printed on those cards. As each poem is read players compete to select the correct end before each other. There are also monster and regional decks, even a Shakespeare deck! Learn more about karuta here. Toshinari Seki is busy doing anything and everything except school work. He sits at his desk in the back corner of the classroom; a master of killing time and covering his tracks. Some kids would create a flip book by doodling in the corner of their notebook or textbook. Seki records a voice track for his story, complete with sound effects. Some kids would bring in a remote controlled car and fool around with it during class. Seki sets up an obstacle course and spends all day taking a mock driving test. Rumi Yokoi is the perpetually distracted girl who sits next to him, and you really can’t blame her! This short form anime is based off of the manga My Neighbor Seki by Takuma Morishige and each episodes run under 10 minutes. Since Seki rarely speaks and Yokoi doesn’t want to get in trouble during class, most of the show is Yokoi’s inner monologue and her reactions to Seki’s shenanigans are priceless. At only twenty-one episodes, the series is the shortest one featured today and will leave you begging for more! 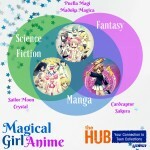 This show is available on DVD as well as streaming on crunchyroll. 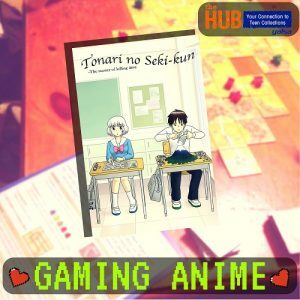 Warning: many games, including a Seki-fied version of Go, make an appearance in Tonari no Seki-kun. Most are not accurate to actual game play. Shogi is played on a board, and is similar to chess in a number of ways. The goal of the game is to capture the opposing player’s king and each game piece may only move in prescribed ways (the king only one spot at a time, in any direction). One major difference is that captured members are absorbed into the aggressor’s forces. Sadly, there are not usually trap doors, or secret identities in Shogi, that is all Seki. Shy middle school student Sendo Aichi is having trouble making friends. The only thing he has going for him is that he has a super rare ‘Blaster Blade’ card from the popular ‘Vanguard’ card game, but he loses his precious card in his first match! Will he ever make any friends? No, wait, that’s Pokémon. If you want more information on Pokémon check out this Teen Perspective post: Digitally Remastered – Comic books for gamers! A trading card game of strategy and luck, Cardfight Vanguard has a fairly standard one-on-one battle structure. Each deck of cards is customized based on what is purchased or won from other players. The first player to receive six damage, or run out of cards, looses. In the show you actually get to see these battles taking place on the planet Cray, but in real life, that is left to the imaginations of the players. The two players decks are shuffled before the game begins, which means that a player with a less expensive deck, but a good sense of strategy and a healthy serving of luck, can win against an opponent with more powerful individual cards. — Jennifer Billingsley, currently reading Denton Little’s Deathdate by Lance Rubin.